So often we need the support of a friend to do that next necessary thing. 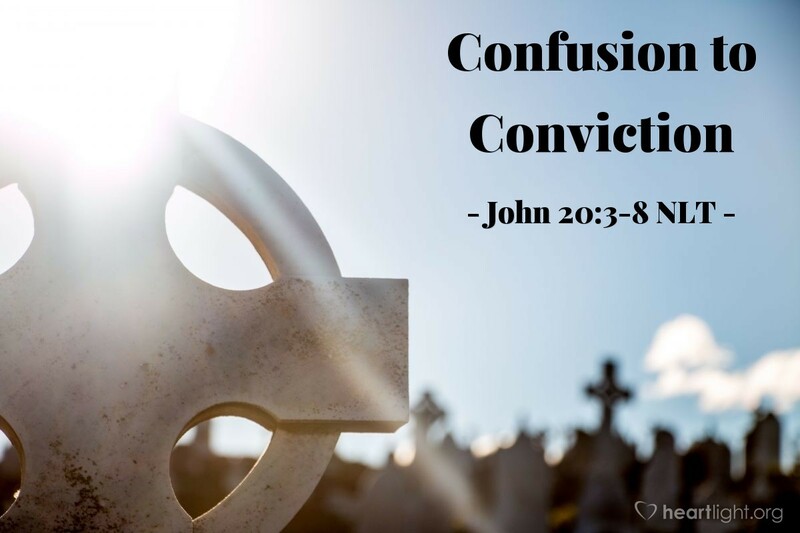 Peter and the disciple whom Jesus loved (John 20:2, presumably John) alternate taking the next needed steps in this story. John outruns Peter but doesn't go into the tomb. He sees just the grave clothes. Peter arrives, goes into the tomb, and sees that Jesus' body definitely isn't there. After Peter, John also goes in and sees, then believes. We need each other. Not just for the times of mission — like when Jesus sent out his disciples in pairs — but also for times of weakness, confusion, and distress. Sometimes, maybe even often times, we can't take the next step on our own. We need the help of a friend who shares our faith. Don't try to do the Christian life solo. We need each other to make it through our dark nights of discouragement so we can enjoy the new dawn of faith centered on our risen Lord and triumphant Lord. Let's help each other to live with our hope in him! Holy God, my heavenly Father, thank you for the friends I have who have faithfully encouraged me and nudged me further down the walk of faith and have often taken that next step to help me get to Jesus. Help me be that friend to others so that they, too, can encounter the risen Savior and believe. In Jesus' name, I pray. Amen.